“ISKCON has no involvement whatsoever in the production / dissemination of the said video”, the organisation said in a statement. The International Society for Krishna Consciousness’s (ISKCON) said ISKCON is politically neutral and does not favour any political party or candidate after a video urging its followers to vote for West Bengal Chief Minister Mamata Banerjee started doing the rounds on social media in the state. The organisation’s communications wing said it had learnt through media reports of the existence of a video purporting to have been produced by ISKCON asking its followers to support a particular political party in West Bengal. “ISKCON has always been and will remain a politically neutral organization which does not favour any party/candidate over the other,” the statement released on March 30, 2019, said. 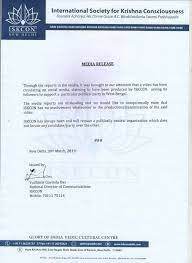 “The media reports are misleading and we would like to unequivocally state that ISKCON has no involvement whatsoever in the production / dissemination of the said video,” Yudishtir Govinda Das, National Director of Communications, ISKCON said in a press release. The entire statement can be viewed below. The same video was uploaded to YouTube on March 29, 2019 by Sangbad Pratidin, a Bengali news publication. The 2.13 minute video documents how the prediction of Srilabhakti Vinoda Thakur, propagator of Gaudiya Vaishnavism, about building a grand temple at Sridham Mayapur, (headquarters of ISKCON), in Nadia district of West Bengal, materialized. A narrator describes how Srila Prabhupada instructed his disciples to get a few hundred acres of land in Mayapur to make it a religious hub. 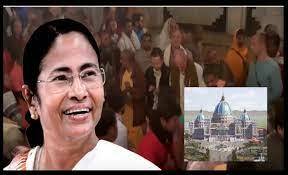 The video then goes on to narrate the contribution of Mamata Banerjee in being instrumental in removing a ‘land ceiling’ thus enabling the construction of the temple. At the end, the narrator urges ISKCON followers to ‘vote wisely for the leader, who stood beside them during the hour of the crisis.’ Banerjee’s photograph with a background of devotees can be seen in the video. It is not clear who was behind the viral video. A spokesperson for TMC was not immediately available for comment on account of it being a weekend. India Today later carried the clarification from ISKCON. BOOM also found a similar article by Sangbad Pratidin has been doing the rounds on social media. The news portal has incorrectly credited the video to ISKCON. At the time of writing the article, Sangbad Pratidin’s report had not been updated yet. 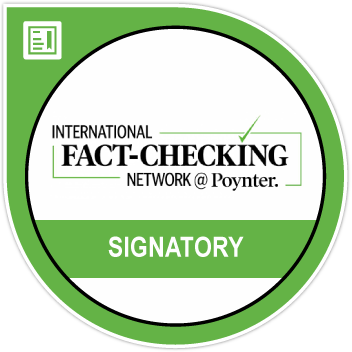 Swasti Chatterjee is a fact-checker and the Deputy News Editor of Boom's Bangla team. She has worked in the mainstream media, in the capacity of a reporter and copy editor with The Times of India, The Indian Express and NDTV.com and is now working as a digital detective, debunking fake news.